*An archive can be ordered. Dial: Original enamel dial with no cracks and glued on markers. With original hands and crown. Strap: A non Patek 18 mm premium leather strap of your choice will be included. Movement: 30 jewels automatic Patek cal. 12-600 movement. 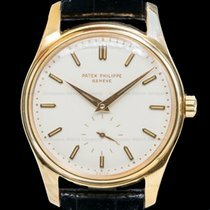 Patek Philippe Calatrava Réf.2526j "enamel Dial"